Italy's coalition government has been generating headlines with its pursuit of populist economic policies that threaten to leave eurozone fiscal rules in tatters. But before EU authorities respond, they should bear in mind that if Italy does not achieve stronger GDP growth, political conditions there could deteriorate further. LONDON – Despite political turmoil and emerging risks at the global level, the eurozone has had two years of strong economic growth, at least by its own historically disappointing standards – and even with the United Kingdom lurching toward withdrawal from the European Union. But with the emergence of a populist government in Italy this year, it is no longer safe to assume that the eurozone’s worst days are behind it. Italy was the first country that I studied when I entered the financial world back in 1982, so I have a special affection for it. 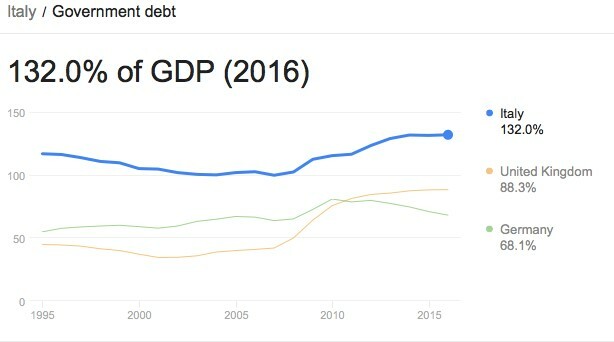 I was working for a very large American bank at the time, and I can still remember joining frequent transatlantic conference calls to discuss Italy’s debt-to-GDP ratio. The question on everyone’s mind was when the country would default; but it never did. Instead, Italy muddled through, and has continued to do so ever since. Still, now that the Italian government seems poised for a standoff with the EU, it would not be surprising if worries about a default were to re-emerge. As my experience more than 30 years ago shows, Italy’s economic problems far predate its adoption of the euro. It has long had poor productivity by European standards, and that translated into relatively low trend growth in the pre-euro decades. At the same time, occasional spurts of faster growth regularly sowed the seeds for various crises, often resulting in devaluations of the Italian currency, the lira. Of course, there are some who now yearn for the days when the lira could be weakened to restore growth. That is no longer an option under the single currency. But what the pre-euro romanticists overlook is that euro membership has given Italy low inflation, and thus lower interest rates. Moreover, there is reason to think that lira devaluations did more harm than good. Even if they offered an occasional competitive boost, they stood in for tougher structural reforms that would have increased productivity over the long term. There are also some who believe that the eurozone’s fiscal and monetary framework locks Italy into weak nominal GDP growth, possibly too-low inflation, and high debt. Yet before the new government took office, Italy’s cyclically adjusted fiscal deficit – as opposed to its underlying debt position – was often rather restrained compared to the rest of the eurozone, as well as the other members of the G7 (Canada, France, Germany, Japan, the United Kingdom, and the United States). Still, the mainstream political parties that governed Italy until this year did not deliver the nominal GDP growth that the country needs. As a result, Italians elected an unconventional coalition whose program combines the policies of the populist left with those of the populist right. While the League party promises to cut taxes, the Five Star Movement (M5S) is pursuing a form of basic income. But what Italy needs is a broad structural reform program to improve productivity. That is the only way to achieve a higher long-term growth rate, given the country’s demographics. In addition to enacting policies to boost the labor-force participation rate among women, Italy must provide more attractive opportunities for its young people. For its part, the EU should do more to help Italy take the tough steps it needs. The European Commission, the European Central Bank, and the German government have erred in insisting on rigid enforcement of the EU Stability and Growth Pact, particularly the 3%-of-GDP cap on fiscal deficits. Although some countries have been allowed to breach the deficit cap during challenging times, Italy is almost never afforded much accommodation, owing to its high debt levels. Yet as the experience of Belgium and Japan shows, high government debt can be reduced only through sustained economic growth. Complicating matters further, some reforms to boost long-term productivity can actually reduce growth in the short term. Thus, any government enacting such measures will need to have the option of pursuing counter-cyclical stimulus. Another problem concerns monetary policy. The ECB could stand to be more broad-minded in how it pursues its inflation target of just under 2%. That target, along with Germany’s own 2% target, leaves Italy locked into a state of low inflation, even when it could benefit from more monetary-policy stimulus. Under these conditions, the EU authorities would do well not to oppose the current Italian government’s plans too aggressively. If mainstream liberals are worried about the implications of a democratically elected populist government, then they should worry even more about what could come next if economic circumstances worsen. At this stage, Italy needs stronger nominal GDP growth – plain and simple. Some will say that it was a mistake to have allowed Italy into the eurozone in the first place, and that an optimal currency zone should have been more discriminating in its membership. But the German and French business communities insisted that the monetary union must include some of Italy’s more competitive companies. And once Italy was considered eligible, so, too, were many other countries. At the end of the day, those with the power to set and enforce EU fiscal and monetary rules know full well that the eurozone could not survive a Greek-style crisis in Italy. It is their responsibility in the months ahead to make sure it doesn’t come to that. Jim O'Neill, a former chairman of Goldman Sachs Asset Management and a former UK Treasury Minister, is Chairman of Chatham House. What does the Chinese leader mean when he talks about a national renewal? In 2012, after being named the new leader of the Chinese Communist Party, President Xi Jinping gave his first public address in front of the 18th National Congress and declared that the party’s main duty was “to achieve the great renewal of the Chinese nation.” It’s an ambitious statement that has induced much debate, not only because it defined a new vision for China’s future but also because it’s an exceedingly hard phrase to translate. The Chinese version is “zhonghua minzu weida fuxing.” The important part is “zhonghua minzu” – which has been translated as “the Chinese nation,” “the Chinese people” and even “the Chinese race.” The problem isn’t really the phrase’s lack of an English equivalent but that, even in Chinese, its meaning is ambiguous. And considering Xi has made renewal of the zhonghua minzu the cornerstone of what he calls the “Chinese Dream,” it’s an enormously important ambiguity. On its own, “minzu” can translate as “nation” or “ethnic group.” The word doesn’t originate from the Chinese language; it comes from the Japanese “minzoku,” a combination of the Japanese words for people (“min”) and for tribe (“zoku”). Minzoku has no English equivalent. It can’t be reduced to “shared culture” or “blood ties” – it includes and transcends these ideas at the same time. Minzoku, like the German word “volk,” has a primordial, racial connotation. The use of these terms was part of the emergence of Japanese and German fascism, whereby the community took precedence over the individual, and the dominant ethnic group was seen as superior to all others. There has been some debate over when and how minzu was first used in China. By the 1880s, Han Chinese elites were regularly using the word to denote their struggle against the ethnic Manchu rulers of the Qing dynasty and their desire to restore China to its rightful place in the world. For a moment, it appeared as if minzu might develop the same way minzoku and volk did. But instead it took on a more egalitarian meaning. Zhonghua minzu, despite its origins among the Han Chinese, became a broader concept in the newly formed Republic of China in 1911, one that represented the unity of the Han, Manchu, Mongol, Hui and Tibetan peoples. Rather than exclude people based on ethnicity, the new Chinese nation would be inclusive and seek to reclaim China’s political dignity on the world stage. Still, some traces of Han chauvinism remained in the phrase. For example, the use of the word “zhonghua.” It can be translated simply as “China,” but the suffix “hua” – literally meaning “flourish” – is a rhetorical embellishment that subtly emphasizes the importance of the people (specifically, the Han people) over the state. Zhonghua was chosen instead of “zhongguo,” which also translates as “China.” Here, the suffix “guo” means “state” and generally refers to a regime’s control over a territory. Chiang Kai-shek, who came to power in 1928, adopted zhonghua minzu, thinking that China’s ethnic groups all descended from the Han. (In reality, roughly 80 percent of China was Han in 1912. Today, it’s closer to 90 percent.) It wasn’t until the Japanese invasion of China in 1937, and the subsequent Sino-Japanese War, that a more inclusive Chinese nationalism would truly take hold, in part as a result of contact with the more aggressive, exclusionary Japanese ideology, and in part because the survival of China itself was at stake. After World War II and the Chinese civil war, Mao Tse-tung and the Communist Party took over. For Mao, Chinese nationalism was a necessary step on the way to achieving a communist state. As he saw it, China’s ethnic diversity was a symptom of class conflict, and once that conflict was resolved, ethnic distinctions would disappear. But China was not quite ready for that yet, so in the meantime Mao tried to use nationalism to the country’s benefit. The party increased the number of government-recognized minzus, from 38 in 1953 to 53 a decade later. Even by the late 1950s, though, Mao thought China was ready for its Great Leap Forward, and, for him, that meant the country was on the verge of becoming a truly communist state and that ethnic minorities were on the verge of obsolescence. Ironically, as China increased the number of recognized minzus, it began an aggressive and sometimes violent attempt to assimilate them. A mythology of national genesis emerged that portrayed the northern Chinese Communists as the rightful heirs to Han China’s unifying culture and millenniums-old civilization. Ultimately, Mao’s Great Leap Forward was a failure. Far from overcoming nationalist ideology and ethnic differences, it ushered in a new era of Chinese nationalism, one that emphasized the pre-eminence of the Han in the zhonghua minzu. After Mao’s death in 1976, the Communist Party adopted a softer approach to China’s ethnic minorities. The reason was simple: The Soviet Union and China’s economic backwardness posed a larger threat than anti-Han sentiments did. China responded by normalizing relations with the United States and opening up to the global economy. This was, in effect, a repudiation of communism, and the emphasis on destroying class distinctions gave way to a renewed sense of nationalism, one that tolerated minorities so long as they saw themselves as part of the broader Chinese nation. Now that China was not fighting for the universal proletariat, but for the advancement of the Chinese people, it became easier to accept ethnic differences. 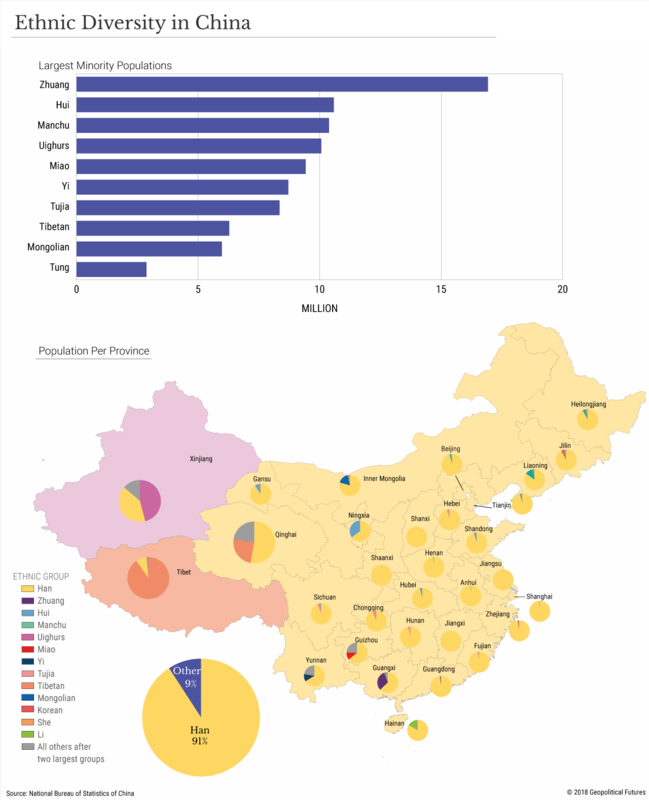 (Since 1984, official Chinese policy has been to grant minority communities a certain degree of autonomy and some benefits, such as tuition subsidies, preferential access to employment and tax breaks.) Moreover, China’s global prestige began to grow, which had been one of the goals of the zhonghua minzu’s first Han proponents in the late 19th century. Some officials and academics used the phrase “zhonghua minzu” during this time, but since taking office, Xi Jinping has revived the term – as well as the debate over its true meaning. A 2017 Financial Times article claimed that zhonghua minzu is a “race-based idea of national rejuvenation,” in effect giving voice to the fear that China didn’t avoid fascism, but rather was simply a century behind others. According to this line of thinking, China will eradicate non-Han elements of Chinese society and use zhonghua minzu for its expansionist aims, such as uniting Taiwan with the mainland or projecting Chinese rule wherever those of Han blood reside. Other experts dispute this interpretation, seeing zhonghua minzu as inclusive and politically defined – similar to the American melting pot that unites citizens of many ethnicities through their loyalty to the same political system. Still others note that in practical terms, little has changed in China’s ethnic policies. As one East-West Center study put it, Xi’s rhetoric is not indicative of “yellow supremacism” but of a relatively cautious politician hoping to use a benign form of Chinese nationalism to bind the country together. It’s impossible to know which of these interpretations is correct – but the recent evidence doesn’t inspire much hope. Xi’s rise to power followed one of the most intense periods of ethnic conflict in China’s recent history. It included the 2008 riots in Tibet that targeted Han and Hui citizens and their businesses; the 2009 Shaoguan incident in which migrant Uighurs and Han Chinese clashed over the alleged assault of a Han Chinese woman; and the 2009 Urumqi riots, which at least one study has referred to as “China’s 9/11,” and which resulted in the deaths of between 197 and 1,000 Chinese citizens. No doubt these episodes are seared into Xi’s memory. Just as he was about to take power, the country’s ethnic minorities seemed to convulse with a seething resentment that can only have heightened his awareness of the dangers his presidency would face. Subsequent changes introduced by Xi have given some indication of his intent. He has made Confucius required reading for Communist officials, an action that would have been unthinkable under Mao, whose ideology was predicated on China’s throwing off the shackles of its past. Harkening back to a sixth- and fifth-century B.C. philosopher’s “national moral thinking,” originally adopted by the Han dynasty, might be thought of as the Chinese equivalent of the National Socialists’ worship of Teutonic knights in the forest. Since his speech in 2012, Xi has further articulated his Chinese Dream, describing it as filled “with glory, hardship, and sacrifice,” and as a rival to the American and European dreams. The insistence that the Chinese Dream is unique because it promotes “world peace and development” fails to distract from the expansionist components of Xi’s vision for China: He wants to lead the country not just to become a powerful nation but to reclaim its status as the Middle Kingdom, the center of gravity for global affairs. But perhaps most unsettling are the recent Chinese policies toward Uighurs in Xinjiang province. Over 1 million Uighurs have been detained in “vocational training centers” and “re-education camps.” According to the Chinese government, these are facilities devoted to preventing the spread of extremism in Xinjiang. There’s no doubt China has cause to fear Islamist extremism, and perhaps that’s all there is to it. Perhaps the Uighur camps are China’s version of Japanese internment in the U.S. during World War II and not a sign of re-emerging Han chauvinism. Or perhaps the forced detention, re-education and ideological cleansing of people based on their ethnicity and religious beliefs is simply so incomprehensible to this analyst after the horrors of World War II that it strains the bounds of credulity and leads to wishful thinking that it couldn’t possibly be a replay of dark times long past. All would-be global powers rely on a sense of exceptionalism to justify the sacrifices necessary to enhance their global status. Zhonghua minzu may well be China’s. Observers can only hope that it will not go the way of the minzoku and the volk and that instead it will lean toward inclusivity, as it did in the early 20th century when the phrase was last in vogue. But China’s current trajectory and ambitions are unlike anything it has experienced before, so perhaps no hope can be taken from its past. As for the meaning of zhonghua minzu, the best translation the English language can give us right now is “Chinese nation” – not in the sense of a country, but in the sense of a people with shared language, culture and values. The deeper question is whether the Communist Party can survive the great renewal of the zhonghua minzu. If Confucius, Uighur concentration camps and dictatorship are the best it has to offer, I confess I am more pessimistic about the party’s survival and more optimistic about the minzu question than I was when I began. A glance at the foreign-exchange markets suggests that the US dollar looks as powerful and dominant as ever. However, taking a much longer-term view suggests that this impregnable position — and the economic heft that comes with it — will come under assault. One consequence of the America First policies of US President Donald Trump will be to create a bipolar financial world, with China at one end and the US at the other. That will mean smaller financial flows between the two, and a much more robust effort from Beijing to eventually challenge the dollar’s status as the world’s reserve currency. That, in turn, potentially has implications for everything from the status of US Treasury securities as the safest assets in the world to how oil is priced. But this more explicit weaponisation of the dollar has not only incurred the wrath of China, it is increasingly alienating government officials and politicians in Europe, the Middle East and Asia as well as infuriating some bank executives. Some of the latter believe the US has been able to impose exorbitant fines for violating US laws because authorities can threaten to lock them out of the dollar-driven financial system. At the Milken Institute’s Asia Summit last month, former French prime minister François Fillon spoke of the need for Europe to push its currency as an alternative to the dollar in an effort to bolster European sovereignty. A world in which the dollar is the dominant reserve currency means Washington can chose to dictate policy to Europe as it has, for example, on the question of doing business in Iran. Europe has no choice but to go along or risk becoming the object of sanctions itself. Yet is it wishful thinking to believe the euro, which according to recent data from the International Monetary Fund has about a 20 per cent share of central bank reserves, can play anything but a minor role. Instead Europe, like the rest of Asia, will have to decide where its future lies — with China or a shrill but shrinking US. When China began trading renminbi-denominated crude oil futures out of Shanghai in March, it was a signal of Beijing’s determination to eventually forge a world in which not everything is traded in dollars. At major Chinese conferences this year, government officials and the heads of some of the most important state-owned enterprises noted that domestic demand for commodities, including oil and natural gas, is so great that it makes far more sense for them to be priced in renminbi. China already uses its own currency to pay for Iranian and Russian oil. Meanwhile, transactions in the Shanghai market are up dramatically. Monthly transaction volumes went from 623m barrels in April — the first full month of trading, to 3.4bn barrels in August to 2.7bn barrels in September, according to CLSA, citing data from the Shanghai International Energy Exchange. Beijing’s ambitions to challenge the status of the dollar can be seen in other ways. For example, the People’s Bank of China now has foreign-exchange swap lines with at least three dozen countries. That is in contrast to the much smaller number the US Federal Reserve has. While few have brought it up even as tensions between Beijing and Washington escalate, the inflow of Chinese money is important for the US government bond market, giving the mainland leverage if it chooses to use it. China and Japan are the two largest foreign holders of Treasuries, whose issuance is increasing as the fiscal stimulus swells the US budget deficit. Without demand from China, rates in the US could go even higher. It may not be in the mainland government’s narrow financial interest to do so but this is a time when politics is clearly in ascendancy. At the same time, the renminbi can only become a reserve currency if it can offer the world attractive RMB-denominated investments. It is thus unsurprising that China is increasingly opening up its own government bond market to foreign investment in the hope that its increasingly liquid market can one day become an attractive alternative to the US market. For investors who are judged on their returns in dollars — no matter where in the world they are based (and that huge group includes many sovereign wealth funds) — a world in which the renminbi becomes more important will add a layer of complexity. When elephants joust, the mice get trampled, the saying goes. In this case, investors are the mice that may get caught in the unpredictable fallout of the tensions between the two jousting trans-Pacific powers. Brussels can’t afford to look weak on its fiscal rules but lacks the means to enforce them. Its solution? Market pressure. These are unprecedented times in Europe. The EU is still engaged in unprecedented exit negotiations with the United Kingdom. Less than a year ago, the European Commission took the unprecedented step of triggering disciplinary measures against Poland, and last month the European Parliament triggered the same so-called Article 7 proceedings, this time against Hungary. Then on Tuesday, the European Commission rejected the draft budget of a member state – Italy – for the first time ever. Though Italy’s government is unabashedly populist and euroskeptical, there’s nothing unusual about an EU country flouting EU budget rules. What’s different this time is that the bloc feels compelled to defend the sanctity of its budget rules but can’t risk forcing out Italy, its fourth-largest economy (and after Brexit, the third-largest) and a founding member. Leaving would be a last resort for Italy as well. An Italexit would be extraordinarily painful for both sides – and it could be a mortal blow for the euro. Rome understands, however, that Brussels lacks the instruments to force compliance on its own. The real threat to Italy is that the EU will try to use market pressure to bend the government to its will. Italy’s debt has been a problem for years, and the country’s nearly five-month-old government has aimed its spending plans at stimulating consumption to spur economic growth. The budget features a deficit for 2019 that is triple what the previous government had agreed to with Brussels and is unlikely to reduce Italy’s public debt – already the second-highest in Europe. It would also expand the country’s structural deficit (the nominal budget balance minus one-off expenses and business cycle effects) when, based on prior agreement, the new budget was supposed to decrease it. The commission’s rejection of the budget is just one step in a longer process; it merely extends a volley of submissions and rejections between the two parties that could last into early December. And although the Italian government must finalize and pass its budget by the end of the year, that doesn’t have to be the end either. In typical, tortuous EU fashion, the affair could easily drag out to the middle of 2019. But the EU is in no mood to wait. It rejected the budget nearly a week before the official deadline for a decision, and EU officials have said they would also consider moving up a decision on whether to sanction Italy, something that otherwise would wait until more complete economic data becomes available in April. (EU rules permit the commission to fine member states that break budget rules up to 0.2 percent of their gross domestic product – a decent sum for Italy but not enough to force compliance.) The bloc is looking for any way to end this fight quickly and decisively. For Italy, on the other hand, a prolonged spat – particularly in which it’s defending the interests of its people – will only strengthen its euroskeptic government. The EU’s best weapon, then, is one it can influence but that it doesn’t control: the markets. In a peculiar role reversal, it’s the EU that has been inciting investor fears lately. Last week, German news outlet Der Spiegel ran a report it later corrected that EU budget commissioner Guenther Oettinger said the European Commission, breaking protocol, had rejected the Italian budget out of hand, without giving Rome a chance to justify its plans. The next day, the commission sent a letter to the Italian government seeking clarification on the budget, which it called an “unprecedented” breach of EU rules. (The claim rings a little hollow; a 2.4 percent deficit wouldn’t even have cracked the eurozone’s top three last year, and France has run larger deficits for years with no penalty.) And on Thursday, European Central Bank chief Mario Draghi refused to be drawn in to mediate between his native country and the commission. Draghi, who vowed in 2012 during the eurozone crisis to do “whatever it takes” to defend the euro, warned the Italian government nearly two weeks ago that the ECB would not come to its rescue if budget talks with the commission failed. He also reaffirmed Thursday that the central bank would end its bond-buying program at the end of the year, a move that should enable yields on long-term government bonds to rise. The strategy is clear: If the EU wants to push Rome to compromise on the budget quickly, without having to make a decision about sanctions, market anxiety is its friend. And it has plenty of opportunities to turn up the heat. Eurozone ministers are scheduled to meet Nov. 5 and again on Dec. 3. The ECB’s Governing Council meets Dec. 13, and this year’s final EU summit is set for Dec. 13-14. Each of these meetings is a chance for the EU to draw attention to the supposedly reckless spending plans of the Italian government – not in front of its peers, but in front of investors. While the EU is emphasizing its differences with Italy, leaders in the country are going out of their way to downplay the dispute. Prime Minister Giuseppe Conte and his two deputies – the heads of the Five Star Movement and the League, the two parties in the governing coalition – have all said recently that Italy has no intention of leaving the European Union or the eurozone. (This despite the fact that the coalition’s first choice for finance minister was Paolo Savona, who has described the euro as a “German cage” and co-authored a paper in 2015 titled “Practical Guide to Leaving the Euro.”) Conte said the two sides would “sit down around the table and talk, just like any family would do” to resolve their differences over the budget. An undersecretary in the League, the party of outspoken Deputy Prime Minister Matteo Salvini, said over the weekend that the current 2.4 percent budget deficit was a “ceiling” that the government may not reach and warned that the 10-year yield spread between Italian and German bonds was a threat to Italy’s banks that could not be ignored. Salvini himself has hinted in the past that a spread exceeding 400 basis points could force the government to reconsider its spending plans, and Credit Suisse cautioned earlier this month that such a spread would be unsustainable for Italian Banks. There’s still plenty of room for compromise. Italy wants to try to spend its way to stronger economic growth, as Portugal did a few years ago. The EU wants to look like it still has control over what its member states do. In a vacuum, the answer would be to revise Italy’s budget so that excess spending is directed toward things that, from Brussels’ perspective, will encourage economic growth and not “clientelism,” as the head of a German think tank described the goals of some parts of the budget. Whether Italy would accept this solution is a different matter. The Five Star Movement won the general elections in March with nearly 33 percent of the vote. Since then, though, Salvini’s League has caught and surpassed its poll numbers to become the most popular party in Italy according to nearly every survey. It would be difficult for the Five Star Movement to concede on the more controversial parts of its plans, such as a costly basic income, without the League forfeiting something in return. The next major event in the saga comes Friday, when Standard & Poor’s will update its rating of Italy’s debt. Moody’s rating agency already dropped Italy a notch last week to Baa3 – just one level above junk status. 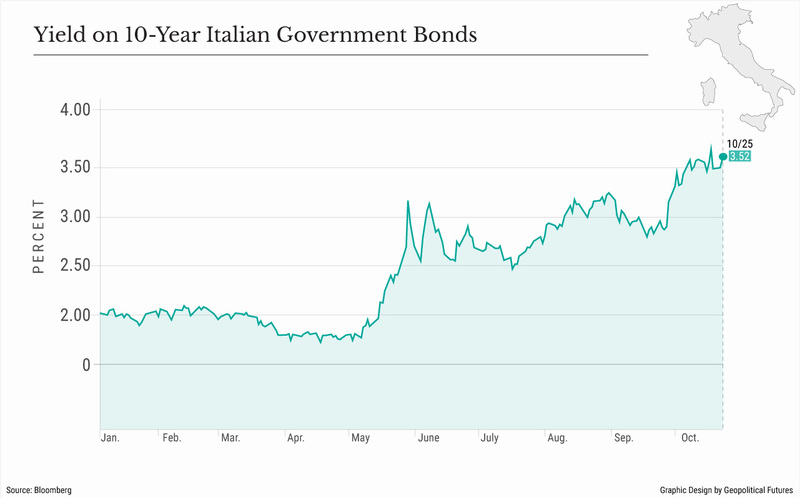 At the time of writing, the spread for Italian bonds sits at 308 basis points, still below last week’s peak of 338 basis points, a five-and-a-half-year high. The best-case scenario for the Italian government is that bond yields don’t skyrocket, it can draw out the dispute while continuing to act as the defender of Italy’s future, and it ultimately secures a very public victory over Brussels. But the EU wants to end this fight as soon as possible. If it actually has to decide whether to penalize Italy in the spring, it will have failed. Public opinion in Italy could shift toward a referendum on the euro, market anxiety could spread to states like Portugal and Spain, and the future of the single currency could come into doubt. Better to let the faceless market be the bad guy. This rise of populism is creating murky financial waters for both emerging and developed markets. Case in point, Italy, where the new populist government is willing to give the people what they want: A break from austerity. But it’s a dangerous move that represents “irresponsible fiscal policy”, Michael Hasenstab, chief investment officer at Templeton Global Macro, told CNBC. Hasenstab describes populist-led fiscal policy as “probably one of the most important political variables we have to look at” when considering investments. Italy’s new coalition government is anti-establishment—and anti-austerity, and it’s promising all sorts of things that the country can’t afford, including tax cuts, basic monthly wage guarantees and more. Italy’s populist leaders don’t have enough wiggle room to take on more debt, and they’ll find that out when Italian bond yields rise further. From an investors’ perspective, this is what will bring down Rome. Italy’s national debt is at 132 percent of GDP and it’s got one of the slowest growth rates in the euro zone, with unemployment at 11.2 percent. And the European Union has mandated austerity since the beginning of the decade. The new government doesn’t feel like bowing to the EU’s monetary guidance, and it’s rebellion is increasingly popular with a public that has grown tired of living under austerity. Italy’s 2.3-trllion euro national debt is worse that Greece. The EU says Italy is courting disaster, facing a massive debt restructuring challenge. And it’s not just a threat to Italy, but to the euro itself. Still, Italy’s populist government is bent on fighting the EU. As recently as last week, it said it sought to triple the 2019 budget deficit plan of the preceding government. 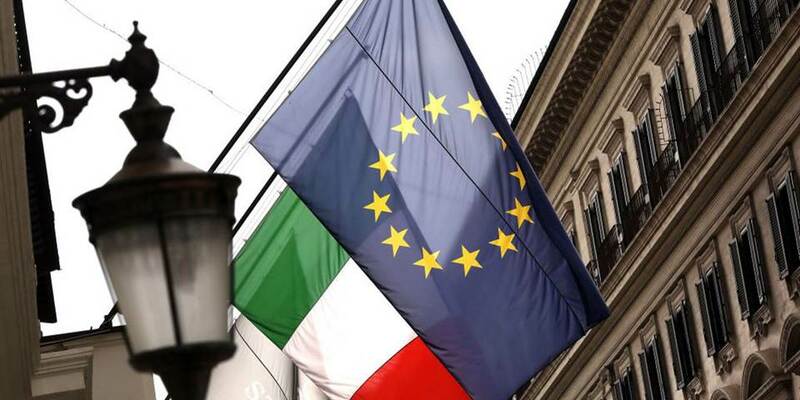 Italy’s financial irresponsibility is sparking cries of everything from “complete insanity” to “sleepwalking into a next crisis”, Reuters reports, citing senior EU officials. “When Tria talked about planning a deficit of 2.4 percent for the next three years in the Eurogroup, jaws dropped everywhere,” Reuters quoted one senior euro zone official as saying. And while Italy may be the worst-case scenario, it’s not the only venue where populism is threatening fiscal policy. Germany is also on Hasenstab’s red flag radar because the far-right is increasingly posing a challenge to the mainstream government. It’s more than just a fleeting concern, too. A new study indicates that populist attitudes are on the rise in Germany—and its coming from the political center. According to a Bertelsmann Foundation study cited by DW, one in three voters now sympathizes with populist policies. So who’s not on Hasentab’s red-flag watchlist? Oddly enough, India and Indonesia. Both countries have unenviable current account deficits; and both are experiencing currency issues, but Hasentab says that despite all, both are “the type of investment we are looking for”. In fact, the World Bank this week said that Indonesia’s weak rupiah is actually a source of strength, Bloomberg reports. The Indian rupee, however, hasn’t enjoyed any such statements from the World Bank, and on Wednesday it closed at its weakest level, opening even weaker Thursday, having lost some 15 percent this year already. Some analysts are warning that the rupee could fall as low as 75 per dollar this year, pushed down by trade wars and rising crude prices. But this isn’t populist-promoted fiscal irresponsibility. Hasenstab notes that India's current account deficit has been negatively affected by rising oil prices, not fiscal irresponsibility. "We still have a very long-term positive view for both India and Indonesia. And we talk about a current account deficit, but really, both of those countries have dealt with oil at a higher price," he told CNBC. "Both countries are pursuing some very sound, be it fiscal policy, or in India's case, really revamping the monetary system ... inflation targeting, tax reform." He might agree with the World Bank’s statement on Indonesia—for India, too. Both countries he describes as a “long-term anchor”. But hedge funds and other investors love the clarity of political situations, like the clear rise of populism in Italy, because it helps to better pinpoint investments. In this case, the new buzz word for political risk is “populism”, and now we’ve got a list.